Brake rotor assembled lateral runout (LRO) exceeding the maximum allowable specification can cause thickness variation to develop in the brake rotor over time, usually between 4,800–11,300 km (3,000–7,000 mi). Brake rotor thickness variation MUST be inspected BEFORE inspecting for assembled lateral runout (LRO). Thickness variation exceeding the maximum acceptable level can cause brake pulsation. Refer to Brake Rotor Thickness Variation Measurement. Matchmark the position of the brake rotor to the wheel studs if this has not been done already. Remove the brake rotor from the vehicle. Refer to Front Brake Rotor Replacement. Using the CH-41013 rotor resurfacing kit , thoroughly clean any rust or corrosion from the mating surface of the brake rotor. Install the rotor to the hub/axle flange using the matchmark made prior to removal. Hold the brake rotor firmly in place against the hub/axle flange and install one of the CH-45101-100 conical brake rotor washers (1), and one lug nut (2) onto the upper-most wheel stud. Continue to hold the brake rotor secure and tighten the lug nut firmly by hand. Install the remaining CH-45101-100 conical brake rotor washers (1) and lug nuts onto the wheel studs and tighten the nuts firmly by hand in the tightening sequence. 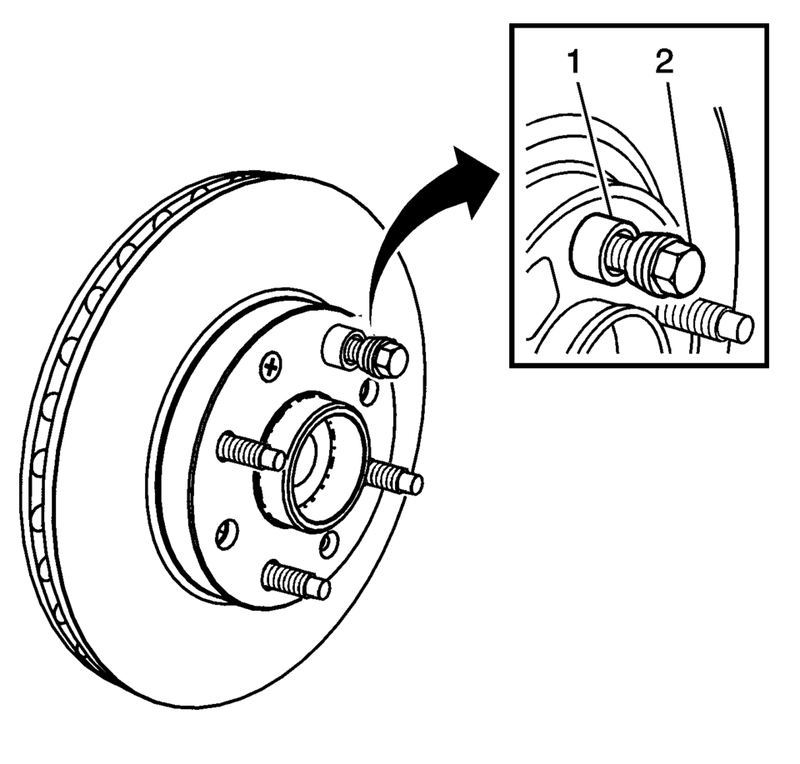 If the brake rotor has been REFINISHED or REPLACED with a new rotor, proceed to step 14. 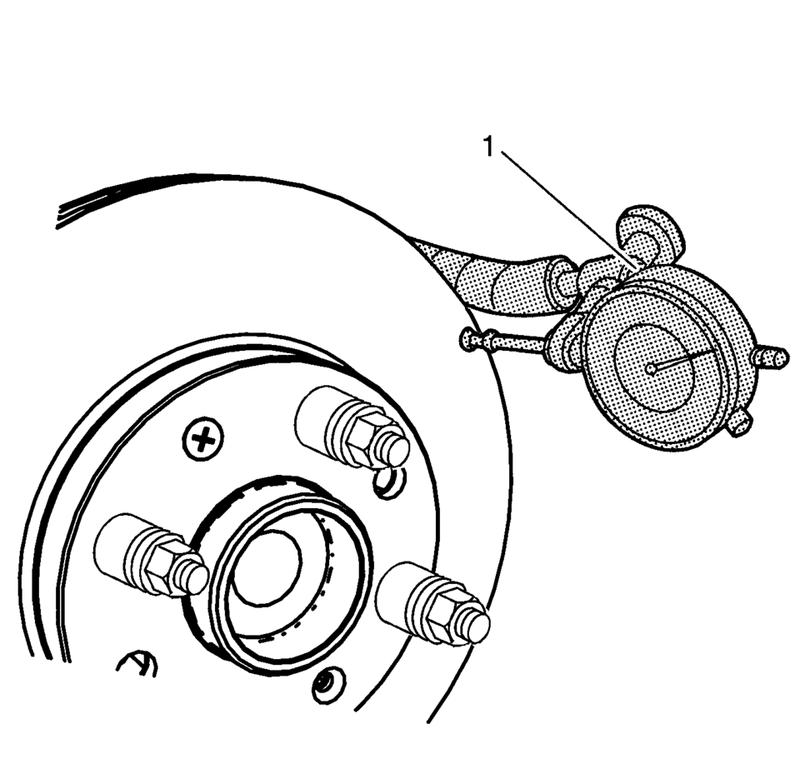 If the brake rotor meets the following criteria, proceed to step 10. The rotor is within specifications and is being REUSED. The rotor has NOT been refinished. The rotor does not exhibit thickness variation exceeding the maximum allowable level. Mount a dial indicator, CH-45101 hub and wheel runout gauge (1), or equivalent, to the steering knuckle and position the indicator button so it contacts the brake rotor friction surface at a 90 degree angle, approximately 13 mm (0.5 in) from the outer edge of the rotor. Rotate the rotor until the lowest reading is displayed on the indicator dial, then set the dial to zero. Rotate the rotor until the highest reading is displayed on the dial. Mark the location of the high spot relative to the nearest wheel stud, or studs. Measure and record the amount of assembled LRO. 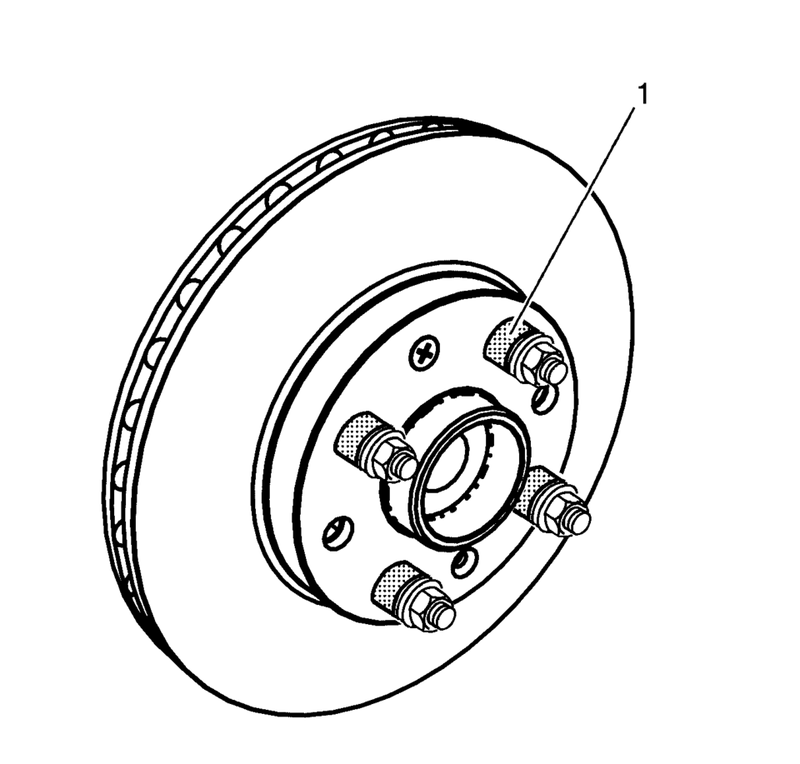 If the brake rotor assembled LRO is within specifications, proceed to step 18. If the brake rotor assembled LRO exceeds the specification, refinish the rotor to ensure true parallelism. Refer to Brake Rotor Refinishing. After refinishing the rotor, proceed to step 14. Mount a dial indicator, CH-45101 hub and wheel runout gauge , or equivalent, to the steering knuckle and position the indicator button so it contacts the brake rotor friction surface at a 90 degree angle, approximately 13 mm (0.5 in) from the outer edge of the rotor. Measure and record the assembled LRO of the brake rotor. Front brake rotor maximum allowable assembled lateral runout: 0.05 mm (0.002 in) . If the brake rotor assembled LRO measurement is within specification, install the brake caliper and depress the brake pedal several times to secure the brake rotor in place before removing the CH-45101-100 conical brake rotor washers and the lug nuts.